St. Petersburg. A View of the antient Winter Palace belonging to her Imperial Majesty and of the Canal which joins the Moika to the Neva, at St. Petersburg. / Vüe de l’ancien Palais d’hiver de sa Majesté Imperiale, et du Canal qui Joint la Moika avec la Neva, a St. Petersburg. Old, antique coper engraving of St. Petersburg, Basset circa 1770. 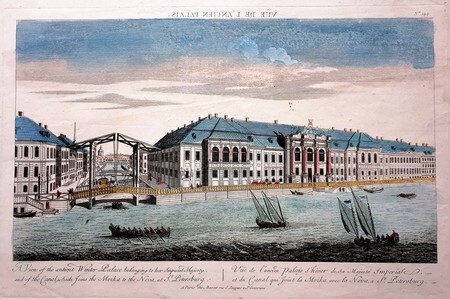 View of the Winter Palace at St. Petersburg, showing the canal joining the Moika and Neva Rivers and boats in the harbor. 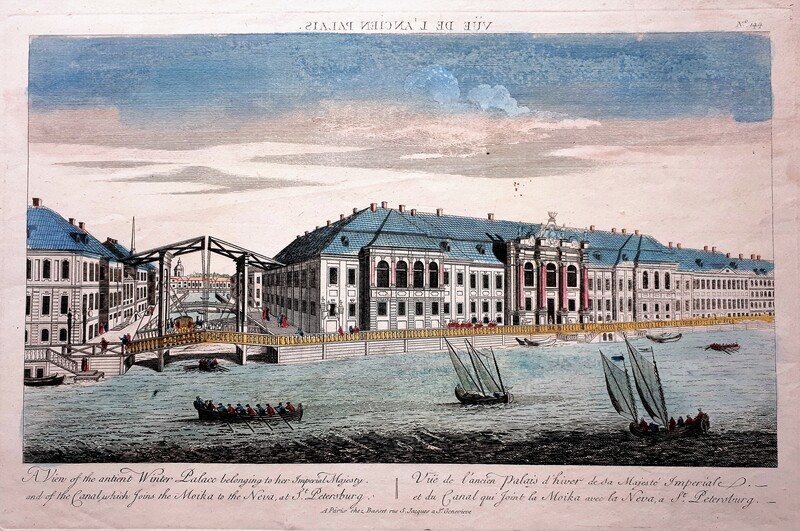 There were a series of buildings called “the Winter Palace” in St. Petersburg; this print shows the third Winter Palace, which was demolished in 1732. Height 27 cm., Width 41 cm.